You play as a mogul that wants to establish a monopoly and get the city for himself. 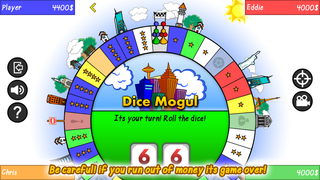 Roll the dice and get as many tiles as you can! 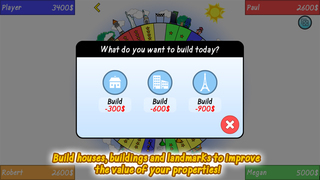 Build houses, buildings and landmarks to increase the value of your properties. Be careful! if you run out of money its game over! - Easy to use: Simple interface and gameplay controls. - Play on a Standard or Random board. - Many Power-Ups to gain advantages over the other moguls: Upgrade, Bomb, Superdice, Minidice and several others! - 5 to 10 minutes matches: Enjoy a fast match and forget those long board games that take hours to finish! Fixes iOS 6 compatibility issues. Fixes some ads still displaying after upgrading the game.